Interview with a Game Ranger! 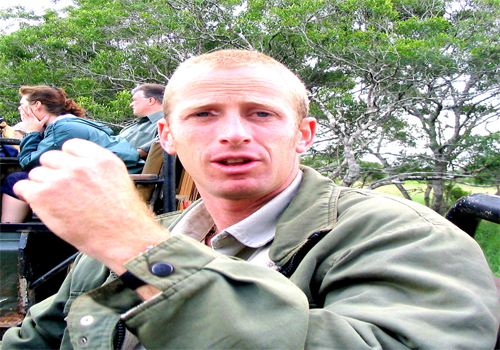 Richard Walsh- a city boy from Johannesburg changed his profession to become a Ranger at Phinda Game Reserve. He shares his experience of taking tourists from all parts of the globe for exciting game drives to see the Big Five. Richard, when did you think of becoming a ranger and how did you go about it ? I always had a passion for the bush and one evening I met a person who was really informed about South Africa and I took it from there. I did an intensive 6 weeks course at Phinda and all guys you see here get trained here. Then you spend another 3 months at the place where you got to be working. How do you go about applying for this 6 week course? Visit http://www.ccafrica.com you will find all the contact details and that will put you on to the correct people who will give you the training. Do you need any other background for this kind of occupation? Not necessarily. What the instructors want to see is if there is a passion for the bush. There is no pre-requisite to have any qualification. I have come from a computer and hotel background and I have reached a time in my life where I want to turn my passion into my work. Is this training open only to the South Africans or can anybody go on to the site and apply for this course? This is indeed a very good question but I am not entirely sure how visas work. most of the guys who work here are either Kenyans or Tanzanians. It is possible that one can do the 6 weeks training and then get back to one’s country and be a part of a Game Reserve but they have to spend 3 months at the lodge for further intensive training. What does the training comprise of and what do you learn in those 6 weeks? The first week is actually very intense. They see how well you do with people because when you are with your guests you are there for almost 24 hours with them. You go for game drives, you dine with them in the evening and it gets really tiring. They basically want to find out what kind of person you are. After that you learn the various rifle handling techniques. An extensive course on trees and grasses including which animals feed on which grasses, a few section on birds comprise part of the training programme. According to me the most important aspect is the rifle training because by law we have to carry a rifle in an area where there are harmful animals especially the predators and even the Big Five. We need to do a lot of work by ourselves – just go around picking up information on the job as well. There is a whole library where we immerse ourselves into reading books from cover to cover to pick up useful points on presentations as we have to get used to speaking to people about things they want to know about. Every week there is a presentation on birds, mammals, reptiles, snakes, crocodiles and so on. What about the training of the terrain, the parks for example – when to turn left and right and not to lose your way in the reserve?There are no signs. That comes in the 3 months when you are going to spend time at your lodge. It’s quite funny because the way you get to learn the roads is: you walk for 2 weeks without taking a rifle and you walk along every single road in the reserve. That’s the best way of learning the roads. It helps to pick up your awareness levels. We walk around 20 to 25 kilometres a day and at times it can get really tiring. You have to carry along with you atleast 8 to 10 litres of water especially in summer. Also, you have to carry bird books, binoculars and most importantly you have to be alert all the time with a good pair of eyes and ears to listen and look out for interesting animals, birds, reptiles and whatever comes your way. What else is included in your 3 months orientation after the 6 weeks training? A lot of it is getting to know where the other lodges operate. The main thing in the 3 weeks is getting to know the reserve itself, different birds’ sounds and you need to know all the animals in your particular reserve. Everything really pertaining to the reserve you learn in those 3 months. During your tenure what have been your interesting and adventurous experiences? Couple of interesting things I have witnessed: Once I saw two male lions killing a warthog. The male lions had actually been walking when they came across this warthog who was walking right across. So I was quite surprised because usually you get to see it from a distance but here I saw it from near while it was happening. Then we saw a couple of Cheetah chases and you see the Cheetah stalking far up from a distance and the animal has no idea that the cheetah’s there. Another interesting things was being treaded by an elephant while I was doing my work of teaching the guests to ride an elephant. Sometimes during our walking tours we track down footprints of a particular animal or animals and try and see whether we can find one of them. Like today we have seen the foot prints of an Aardvark but I have to still see an Aardvark. Thus all sorts of interesting and hairy experiences you will come across when you actually work here. Tell us about a day in the life of a ranger? As part of your training do you learn how to maintain the vehicle? Yes we do a lot of vehicle maintenance. We have basic knowledge of what can actually go wrong. We should also have an all round knowledge of the vehicle because vehicles are an important equipment in the life of a ranger. Most of the guys are actually from the city. It is pointless working for five days and getting a day off, you can’t really go anywhere. We work six weeks in a row and then we get 2 weeks off. So we really don’t get weekends off. After working for 6 weeks we do need a good decent break and 2 weeks is quite enough. Most of the guys go back to their families and we can do quite a lot of travelling. We can go to another lodge and get to know the people and the environment, learn a little about the different parts of South Africa. Personally I try and spend a week in the jungle. Which are the other Game Reserves that you have been to besides Phinda? I have been to Londolozi . That was almost 4 years ago – that’s the only other place I have been to. 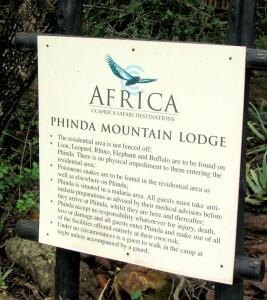 Apart from Phinda there are other lodges – one of them called Bongani which is in Kruger National Park. Londolozi is an extension of the Kruger National Park. There is another reserve in the Eastern Cape and a couple of other game reserves on the Botswana border including Madikwe. At the end of this year or the beginning of the next I will visit all the reserves. Are there any areas of specialization besides game drives and jungle walks? There is a project here and there is a ranger who studies all day the movements of leopards. He works on it 24 hours a day and he has become a nocturnal creature himself because leopards are nocturnal and they are only out at night. There is another project on the study of Elephants, their movements, their family structures – a lot of people from overseas come here and do their PhD and study the Elephants here. Do you see yourself doing any special projects in the near future? I don’t think I will do the projects. I will stay here for 2-3 years and conduct tours and then I would like to go and work in the other lodges like Londolozi. If it’s possible I will go to Kenya or Tanzania where there are some fantastic lodges which I have actually been to. What is the lifespan as a Ranger? Rangers work only for generally 4-5 years, that’s because the hours that we work are very demanding. Most of the guys become a Ranger because they have finished studying and they are not quite sure what they want to do. They come to the bush for 4 or 5 years . A lot of guys here are around 22 years of age and they will be there till the age of 27 and you do suffer from the syndrome of getting burnt down. This is because we work for 6 weeks continuously and then take a 2 week off: we get very tired. Family life is also absolutely non-existent unless your partner enjoys being out in the bush with you. What are the attributes required to become a ranger? The main thing is the passion for the bush – You have to be driven by something. A lot of people take up Wildlife Photography and that’s a fantastic thing to do. You need to have the passion for trees, photography or birds – there is so much to keep you entertained. I think one should have the passion for one of those things as a reason of being here. I believe that you need to have the enthusiasm to pass on the same to your guests without which you cannot give your guests the entire bush experience. On your personal side what are your likes and dislikes? I like bird watching and cycling when weather permits. Before I came here I used to play a lot of field hockey. Since you are working with CCAFRICA towards conserving wildlife what is your message to the readers of Namaste South Africa and what role can they play in conserving wildlife? CCAfrica has a wonderful mission statement “Care of the Wildlife, Care of the Land and Care of the People”. And I do believe that you can’t really have one of those sections missing. CCAfrica actually does a lot of work for communities, to show the benefits of lodges and conserving the wildlife existing in South Africa. You can’t really have conservation without the care of the people and the surrounding community. Land Management is also an extremely important work without which you can’t have anything left. So care of the people, land and wildlife is extremely important in conservation.